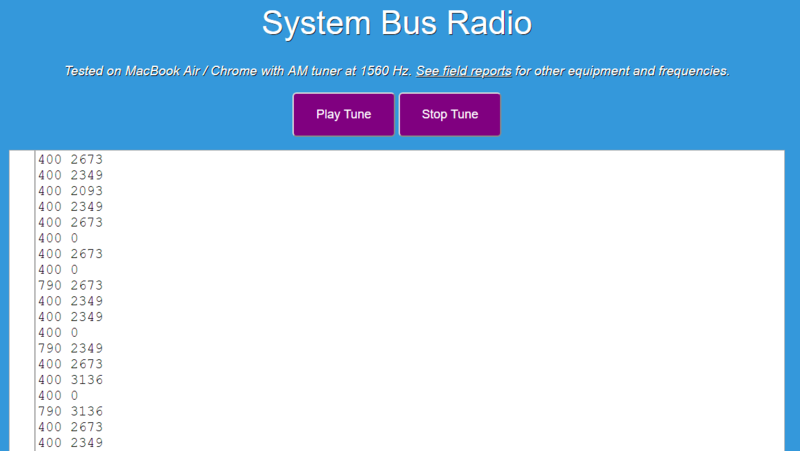 Recently we've come into knowledge of a program on GitHub called "System Bus Radio" which lets you transmit RF directly from your computer, laptop or phone without any transmitting hardware at all. It works on the principle of manipulating the unintentional RF radiation produced by a computers system bus by sending instructions that can produce different AM tones. An SDR like the RTL-SDR V3 or RTL-SDR with upconverter, or any portable AM radio that can tune down to 1580 kHz can be used to receive the tones. To run the software don't even need to download or compile anything, as there is now a web based app that you can instantly run which will play a simple song. However, the RF emissions don't seem to occur on every PC, or are perhaps at another frequency. We tested a Windows desktop and Dell laptop and found that no were signals produced. A list of field reports indicates that it is mostly MacBook Pro and Air computers that produce the signal, with some transmitting signals strong enough to be received from a few centimeters to up to 2m away. This could obviously be a security risk if a sophisticated attacker was able to sniff these tones and recover data. By trial and error, the above frequency was found to be ideal for that equipment. If somebody would like to send me a SDR that is capable of receiving 100 kHz and up then I could test other frequencies. There is also an interesting related piece of software based on System Bus Radio called 'musicplayer', which takes a .wav file and allows you to transmit the modulated music directly via the system bus. If you're interested in unintentionally emitted signals from PCs, have a look at this previous post showing how to recover images from the unintentional signals emitted by computer monitors. This is also similar to RPiTX which is a similar concept for Raspberry Pi's. I’m showing my age, but I remember an IBM 1401 program playing a song through an AM radio sitting on top the CPU. It’s probably just flogging something that’s requestiing I/O activity – playing an inaudible sound, sending network packets, something even a script can do. Receive radio signal from bus of Double Data Rate Synchronous Dynamic Random Access Memory DDR2 desktop an DDR3 desktop and notebook with single and dual channel. HackRF One, RF Analyzer and Andoid phone use to receive, display signal and record video. if you look at my other videos you can find how you can also transmit digital messages, encoded and decrypt them. … What’s a web app doing on the system management bus?